Sri Lanka's reinstated prime minister Ranil Wickremesinghe, center, waves to his supporters during a rally in Colombo, Sri Lanka (Dec. 17, 2018). The crisis started with Sirisena’s party, the Sri Lanka Freedom Party (SLFP) leaving the unity government. The next step was Sirisena ousting Wickremesinghe and tapping former President Mahinda Rajapaksa as the prime minister in late October. Yet Rajapaksa struggled to prove that he commanded a majority of the Parliament. Wickremesinghe earlier claimed that even though the SLFP left the unity government, he and the UNP still commanded a parliamentary majority. However, Sirisena issued a gazette notification dissolving the Parliament, preventing the legislature from clarifying the issue of who commanded a majority. The Supreme Court of the country suspended the dissolution of the Parliament and ruled it unconstitutional. Later, the Parliament was reconvened and despite the hostility in the chamber, a no-confidence motion was passed against Rajapaksa holding the office of the prime minister. Out of 225 MPs, 121 parliamentarians voted in favor of the no-confidence motion. However, the no-confidence motion against Rajapaksa didn’t mean that Wickremesinghe commanded a majority of the Parliament either. The UNP, the party headed by Wickremesinghe, had only 106 parliamentarians while a simple majority requires a minimum of 113 MPs to show command of the Parliament. Earlier Wickremesinghe had more than two-thirds Parliament majority under the unity government formed together with the president’s party. 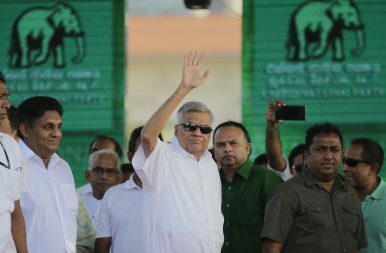 The Tamil National Alliance (TNA), which represents a majority of the Tamil population in Sri Lanka’s Northern, and Eastern provinces came to the rescue of Wickremesinghe and the UNP. The TNA, which was an opposition party, extended support to the UNP to gain a parliamentary majority. TNA MPs voted in favor of Wickremesinghe in a vote of confidence. Subsequent to the TNA supporting Wickremesinghe, Rajapaksa’s faction claimed that TNA leader R. Sampanthan cannot hold the office of the opposition leader any longer. Later, parliamentarians who support Rajapaksa informed the speaker in writing that a majority of the opposition wanted Rajapaksa to be appointed as the opposition leader, and he now holds that post. The path to reinstating Wickremesinghe as the prime minister was quite a ride and the judiciary played a crucial role in it. Sirisena had earlier insisted that he would not appoint Ranil Wickremesinghe as the prime minister again, but he was compelled to do so after pressure from the Parliament as well several court rulings. During this political crisis, the judiciary played a vital role. A number of petitions were filed in the Supreme Court as well as in the Court of Appeal challenging the decisions taken by Sirisena. Some of the verdicts are still yet to be delivered. The key petition was filled by a group of UNP MPs; some of them were among the ministers ousted on October 26. The petition claimed that the president has no authority to dissolve Parliament at this point without having the approval of a two-thirds majority. The power vested upon the president to dissolve the Parliament after it completes just one year of its term was taken away by the 19th Amendment to the constitution, passed with the support of more than 90 percent of the MPs (including most of the MPs who support Rajapaksa). Sirisena would have expected Rajapaksa to secure a majority in the Parliament using several crossovers, as Rajapaksa has done in the past. As president, Rajapaksa was very successful in fishing MPs. In 2010, Rajapaksa was able to get UNP parliamentarians to cross over to his government to secure a two-thirds majority in the Parliament. However, this time it was different. Rajapaksa failed to secure a simple majority of the Parliament and 121 members out of 225 voted in favor of a no-confidence motion against him. However, that was not sufficient to remove Rajapaksa from the post of prime minister — Sirisena as well as the MPs supporting Rajapaksa claimed that the no-confidence motion was brought in violating the standing orders of the Parliament. Subsequently, the matter was taken to the Court of Appeal, which issued an interim order suspending Rajapaksa from acting as the prime minister along with suspending the cabinet ministers from holding their posts, citing the results of no-confidence motion. After the Supreme Court delivered its ruling stating that the president has no power to dissolve Parliament prior to four-and-a-half-years into its term, Rajapaksa said he would resign from the post of prime minister, although the legality of him holding the post in the first place was questionable. Subsequently, Wickremesinghe was reappointed as prime minister. The political instability of late 2018 affected the Sri Lankan economy badly. For one thing, the political crisis postponed the government budget for 2019, which was to be presented to the Parliament in November. Subsequent to the reinstatement of Wickremesinghe, Finance Minister Mangala Samaraweera presented a vote of accounts to the Parliament to obtain approval for government expenditure for the first four months. Accordingly, the budget for 2019 will be presented to the Parliament early this year. At the time the political turmoil started, Sri Lanka’s domestic currency had started to fall significantly as a result of a strengthening dollar. The political crisis made the situation much worse and with the increasing uncertainty, foreign investors started to exit from the domestic security market, increasing the outflow of dollars. This resulted in the Sri Lankan rupee depreciating at a much faster rate. With the high level of uncertainty, the yield for Sri Lankan bonds in international capital markets increased significantly, posing a risk to increase the interest rate on international capital markets. These implications resulted in three major credit rating agencies downgrading the credit ratings of Sri Lanka. Moody downgraded Sri Lanka’s ratings from B1 to B2 while Fitch and Standard and Poor both downgraded Sri Lanka’s credit ratings from B+ to B, citing the policy uncertainty and the risk to the fiscal consolidation due to the transfer of power. The downgrades were not baseless. In addition to the government budget not being presented on time, several changes were introduced to the recently passed Inland Revenue Act, which simplified the taxation structure of the country. These arbitrary changes raised uncertainty among investors, undermining the major objective of introducing a new Inland Revenue Act in the first place. At this point, the government headed by Wickremesinghe and the cabinet of ministers is carrying out its functions. Although political instability and tension seem to have eased, a fire is still smoldering under the ashes. The president has already indicated his displeasure about having to work with the Wickremesinghe government and Sirisena maintains some executive powers. That leaves us with number of possible scenarios to be witnessed this year. The next general election is due in September 2020. However, the president can dissolve the Parliament in March 2020, when the Parliament will complete four-and-a-half years of its term. Yet, before that, Sirisena’s own presidential term will be concluded. Presidential elections are due between November 2019 and January 2020, but Sirisena could call for earlier polls. The next president — whether a re-elected Sirisena or a new face — should be sworn in by January 2020. Prior to the General Election and presidential elections, several Provincial Council elections are due. Subsequent to the recent crisis, there is also renewed talk about a new constitution with changes to the executive presidency. That would result in a national referendum, the first in more than two decades.